The "Pastourelles de Campan ", a company of popular art and customs from the high Bigorre, was created by Mrs. Yvonne Arene Cuille in 1918. She patiently collected all the costumes, dances, music, songs, legends and poetry of the whole valley of Adour. 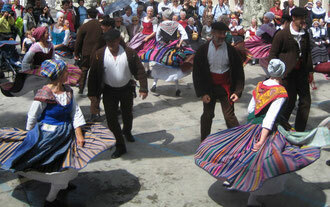 The "Pastourelles de Campan" danced in all the main French cities. These last years The "Pastourelles de Campan" represented France in Qatar, Croatia, Italy, Roumany ,Hungary , Poland, Spain and Portugal. In this moment there are 70 members reparting in 40 under 18 years old and 30 past 18. Campan is a shepherds' village in the mountains. It is situated at the foot of the Pic du Midi de Bigorre, along the shores of the river Adour, between the high passes of Aspin and the Tourmalet, at 12,4 miles from the world famous city of Lourdes in the county of the Hautes Pyrénées. 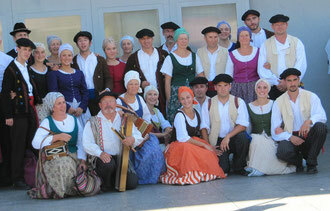 The group gives performances showing farmers’ daily life, during the seasons at the end of the nineteenth century. Men, women and children tell this family life where neighbours have an important role. The help from neighbours during the evenings, during different works, the harvests and the marriage always takes a festive character. Our repertoire is based upon rounds,”quadrilles” and lines. The most frequently we dance their by couple. The men have 3 own dances which show their agility for example they jump above a belt or the “beret” (sort of cap).A round very specific of Campan is when we dance with red and blue belts: the men jump above the belts ; the women do on it a specific step :the Pyrenees Step. Women's costume : A very wide striped skirt made in coloured wool, a tight fitting waist-coat, a linen blouse, a silk or cotton scarf on their heads, and on top of it a red "capulet": a piece of material bordered with black velvet. Men's costume : Narrow thick brown woolen trousers, and ample and long linen shirt, a woolen jacket adorned with embroideries and a coloured woolen waist-band. A "béret" (sort of cap), a salt pocket and a "sarpe" (kind of primitive rucksack), clogs with apointed end and a heavy woolen cape.